Wedding Insurance: What is it? Special event wedding insurance protects a couple if they are sued as a result of a mishap at their wedding that injures a guest or damages the venue. It also covers lost rings, presents, gowns but does not cover the missing best man. Alex and Robin spend months planning their summer wedding on a relatives farm. On the big day a forest fire blocked access to the farm. With the right wedding insurance policy, the couple can postpone their wedding and receive the money they lost (less the deductible)—including money for the invitations, wedding cake, food, rented dresses and suits and non-refundable deposits for the band, flowers and other suppliers. The ring is stolen from the truck of the best man’s car. Special event wedding insurance will pay for a replacement. Right before walking down the aisle, the marquee tent is buffeted by wind and comes loose from its moorings and injures guests and destroys the buffet. The wedding insurance policy will provide the wedding couple with a lawyer to defend the resulting lawsuits from friends and relatives and the policy will also pay for the judgement amounts and will pay for the food and destroyed catering tables. A basic one day wedding insurance policy that covers: attire, presents, deposits and venue liability usually costs anywhere between $130 and $350, depending on the amount of coverage you want. 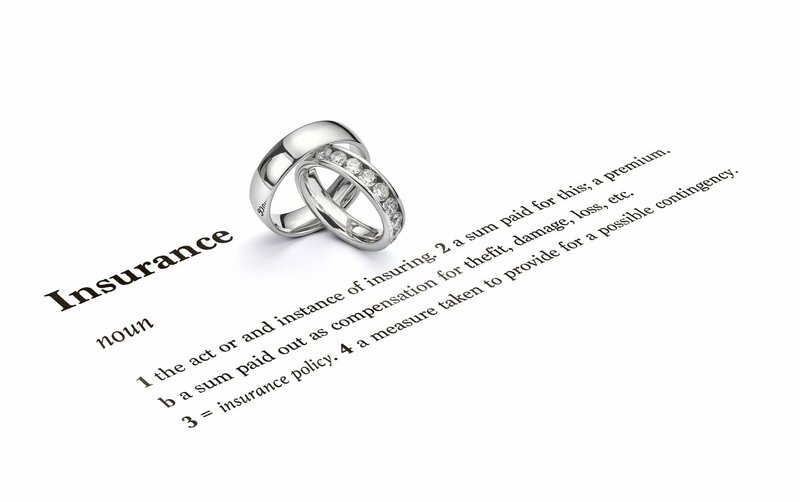 If you cannot afford the costs associated with a lawsuit then it is smart to transfer the risks of your wedding to an insurance policy. The cost of one day event insurance for a wedding is usually 1% or less than the cost of your wedding budget. Often the venue will not allow you access until you prove you have short term venue liability. The venue may also want to see evidence of venue alcohol liability. When Should You Get Wedding Insurance? As soon as you start your wedding checklist. Let's say you put a deposit on your wedding venue months in advance of your wedding date and then it is damaged in a windstorm a month before the big day. With online wedding insurance, you'll receive your deposit back. Check our online site to learn all the ways you will be protected. Cheap event insurance is available for your wedding online with no need to talk to an insurance broker. Get a free wedding insurance quote in 3 minutes. About: Front Row Insurance Brokers Inc. is an independent insurance broker that provides wedding insurance for the lowest possible cost. Should a claim occur, Front Row ensures that business rental insurance client receives the money they are owed per the office insurance policy, as quickly as possible. Front Row has offices in Vancouver, Toronto, Montreal and Halifax.